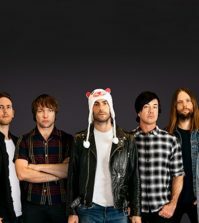 After a three-year hiatus in the popular music scene, Maroon 5 marks their return with the release of their sixth studio album, “Red Pill Blues,” in early November. The pop-rock band has come back with a soft rock, hip hop and R&B-inspired album greatly differing from their previous sounds. Before diving headfirst into the music, it’s just as important to step back and look at the external characteristics of the album. Its title, “Red Pill Blues,” alludes to award-winning sci-fi movie “The Matrix,” giving the album a serious tone right off the bat. 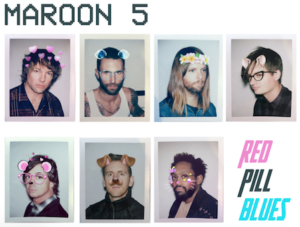 On the other hand, the cover art features polaroid pictures of the seven members of the band, each with a different Snapchat filter over their face. The combination of the two showcases how the band may want to display a different side of themselves, but aren’t capable of doing so without throwing something quirky and fun into the mix. Landing within the top 20 on the US Billboard Hot 100, all four of these songs were very poppy in nature and unfortunately did not give fans an accurate impression of the genre of the new album. Not until the final single was released before the album finally dropped, a soft, rhythmic piece entitled “Whiskey (feat. A$AP Rocky),” did fans get a true taste of the new Maroon 5. The soundtrack opens on a groovy note with “Best 4 U,” a beat-heavy tune where Adam Levine carefully explains to a girl that it would be best for them to break-up. In “Bet My Heart,” the frontman sings about wanting to risk everything for his love, but at the same time acting hesitant. The catchy “Who I Am (feat. LunchMoney Lewis)” lays all feelings out on the line for Levine’s love interest. The remaining songs on the last half of the album follow a similar theme. In “Girls Like You,” the frontman truly believes that he and his love belong together. As Maroon 5’s longest track ever, with three minutes of singing and eight minutes of somewhat unnecessary jazzy instrumental, “Closure” is a tune that will leave you wanting more. The most somber of them all, “Denim Jacket” tackles the longing and regret of a lost lover, which somewhat goes along with the following song, “Visions,” where Levine can’t stop seeing this girl. “Plastic Rose” seems to bring the album full circle, with Levine being exasperated with his relationship. Overall, the general style of the album can be described as laid back and smooth. With this newest release, the band has made it very clear that the “Songs About Jane” era is over and done with. It may not be what diehard Marooners wanted or expected, but in the end it doesn’t really matter. It’s evident that the band has put a lot of effort into “Red Pill Blues,” and they’re certainly proud, no matter the outcome. It is still too early to decide if the album will do as well as its predecessors, but as for right now, “Red Pill Blues” seems to be on its way to the top.